So I just got a new app called Shot Designer from Hollywood Camera Work. It’s kind of, you know, amazing. 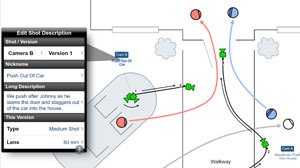 Overhead schematics are the universal tried-and-true way of planning out your shots and blocking for a scene. Many times it’s a scribbly mess of chicken scratch on a piece of paper in a quick meeting at the end of a shoot day for the next day’s work or first thing in the morning, if you’re really tired. But when time is available, planning shots in advance is obviously the way to go. I’ve used the traditional pen-on-paper approach most of the time, but that can become a mess and a waste of paper. Other times, I’ve used Illustrator or SketchUp to plan out shots, but that’s always been a painstaking process as well. It looks great, but it usually takes way longer to do than is worth it and the pen-on-paper approach takes on a whole new attractiveness. Wouldn’t it be great to have something WAY easier, fast, and fun to use? Enter Shot Designer. It’s an app that is clearly designed for touch devices and is available for the iPad, iPhone, Android, Kindle Fire (&HD), Mac and PC. I was introduced to it by the creator himself, Per Holmes. I watched the tutorials first and was blown away at the speed and ease of creating a clear, effective, dynamic, and beautiful shot plan. I especially love how smooth the interface is and how pretty the diagrams end up. You can even animate the movements of characters and the camera to illustrate clearly and without confusion what crazy ideas you have in your head. Try doing that on paper! Another great thing about this app is that it takes no time at all to draw up a move so you can show someone “live” if you need to. The app even creates a shot list on the fly. All these words I’m writing is a futile attempt to share how awesome and powerful this app is. You really should watch the intro and tutorial videos on the website to see how amazing and crazy easy-to-use this app is. And then download it. I don’t own an iPad (inconceivable, I know) so I used it on my iPhone and my MacBook Pro. Based on the tutorials, it looks significantly more fun and easy to use on an iPad, but was still super easy to use on the Mac. It was easy to use on the iPhone as well, but the small screen makes it a little harder to work with. I would think that an iPad would be the best method of working with this app. The app is FREE, too! You can work on one scene at a time with the free version but you can upgrade to the Pro Upgrade for $19.99 which adds the ability to work on multiple scenes, export PDF and Excel files, save multiple versions of shots for options, work on a Mac/PC version, and more. There are so many features in this app, it’s incredible and ridiculous. 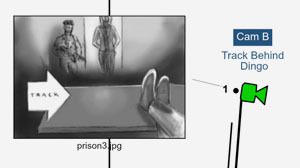 It even has the ability to incorporate stills from your camera to work as storyboards and attach them to cameras to demonstrate even more clearly what the shots will look like. 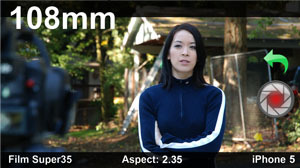 On top of that, it even comes with a director’s viewfinder feature. It goes on. Go check it out! Just downloaded shot designer, so far it’s cool! I’ve been celtx, shot lister and Action Pro ( http://www.Action-Pro.tv ) Those apps together have helped me create and finish my projects much faster. I’m still learning about movie making and i hope to one day make a feature film. Any advice? cheers! Thanks for your comment, and sorry for the delayed response. I’ve been pretty busy! I’m glad you’re finding the app helpful. On the advice side, just keep going! Keep reading books and magazines on filmmaking. Soak it all up. Learn the language of film. Read about the techniques. Watch behind the scenes videos. Be observant of EVERYTHING. And most importantly, make movies! It doesn’t matter how simple or dumb they may be. You should see my first videos and you’ll know what I mean. Study, observe, create, improve! Good luck!